The Sterling held on to tight intraday range against the greenback, as investors wait for some Brexit certainties. UK macroeconomic calendar quite busy this Friday, with monthly GDP included. 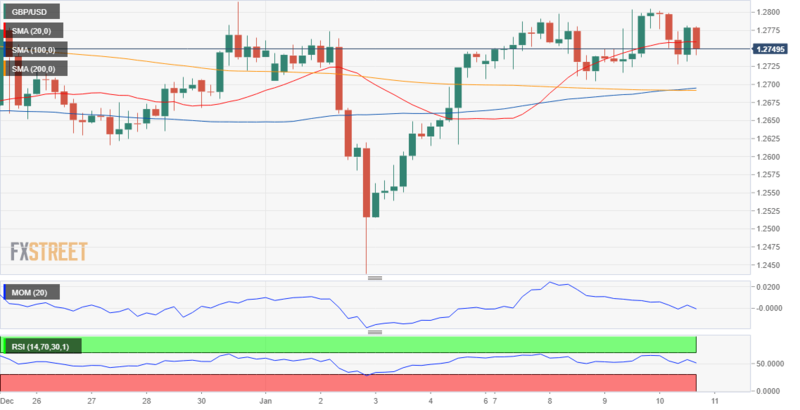 The GBP/USD pair spent the day within familiar levels, shedding some ground to settle around 1.2750, as no new Brexit-related headlines hit the wires, and prevalent dollar's weakness helped to keep the Pound afloat. Speculative interest is holding its breath in regards to the Sterling, ahead of the key Parliamentary vote on May's Brexit deal next week. In the meantime, the UK will release multiple relevant figures this Friday, including Manufacturing and Industrial Production, trade data, and monthly GDP. In the Brexit front, opposition leader Jeremy Corbin said that he would call for an election to break the deadlock. The pair turned neutral in the short-term, as the 4 hours chart shows that technical indicators lack directional strength, stuck around their midlines, while the price is battling and also directionless 20 SMA. The 200 EMA continues providing an intraday support at around 1.2720, with scope for deeper slides on a break below it. Selling interest will also seize their chances on attempts to advance beyond the 1.2800 figure.